I have been observing peafowls for quite a long time now. On a number of occasions I have observed two peacocks (males ) fighting to defend their territory or for mating right. 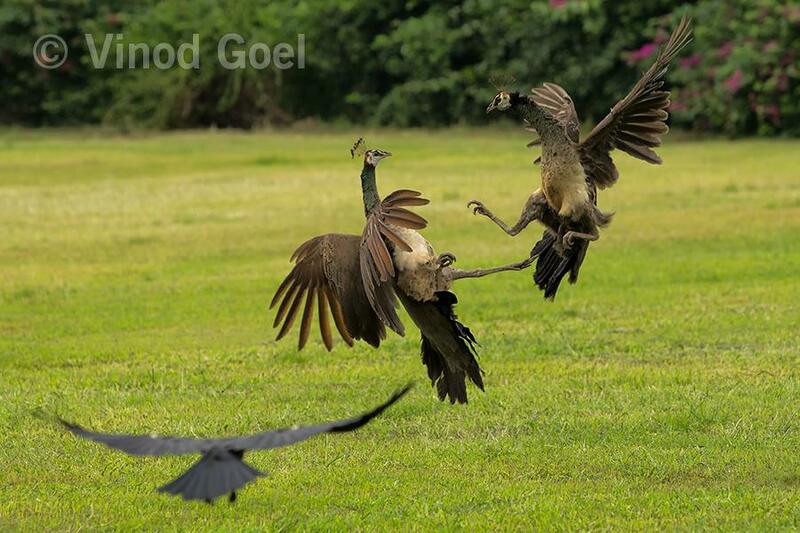 However it is very rare to see two Peahens( females ) fighting with each other. The question is for what. My observation have been that they do have affinity for a particular male and they are ready to defend or protect him at any cost. Recently I observed two peahen fighting and they fought for a long time , Were they fighting for a specific male .I doubt as the breeding plumage have been moulted by majority of the peacocks in Delhi. While they were fighting, a house crow was witnessing the show and behaving like a refree. He was trying to see the fight from different angles from the ground as well in flight. Enjoy the rare capture from the wild !